Custom framing your art is often more expensive than the art itself. How weird is that? There are so many places nowadays to find good, cheap art, but framing said art can be one of the most expensive aspects of decorating your home. Unless you have your own equipment or some killer coupons, professional framing can easily set you back $60-$200 per 8x10 piece of art. If you're like me, and have an eclectic collection of paintings, drawings, and collage, you probably also DON'T have the kind of dough it takes to professionally frame your whole collection. Well, there are plenty of ways to display your art that don't involve thumb tacks or poster putty (or pricey custom framing) that are still funky, fun, and cheap. Oil paintings (and often acrylics, for that matter), aren't typically framed behind glass. They can be, but the glass has to be set off of the painting, because if it comes into contact with the paint, even if it's dry, the paint might stick to the glass. Oil paintings are typically made on canvas, and are stretched onto a wooden frame that gives them shape. You can add a frame to the outside or just hang a stretched canvas without a frame — my point is not to invest in a big heavy piece of glass if you don't need it. Similarly, posters can be mounted onto posterboard and framed with a simple poster frame that may or may not include glass — the less glass you use, the cheaper (and lighter) the end product is. Matting is always optional. The larger the matting, the more expensive the project, so for bigger pieces, you might want to avoid matting. However, pre-cut matting is fairly inexpensive and can really make a difference in the quality of a framed piece of art. This isn't the cheapest option, because even premade frames aren't cheap, but they are easy to deal with and involve minimal effort on your behalf. Frames come in many different sizes, so you can find something to fit most any piece of art. When buying a frame, take the piece of art with you so that you can see how it will look in the frame. There are many different types of frames available these days: you can buy wooden or plastic frames, frames with or without glass or plastic covering the art, frames with or without matting, and even frames without frames (essentially a piece of glass and a piece of particle board that you stick your art between). Generally, the more ornate the frame, the more expensive it will be. You can buy frames at stores like Target or Walmart, although selection may be limited. Better options include art supply stores or frame stores — check your local paper for coupons or ask a store associate when the next big sale is in order to find the big savings. A simple frame for an 8x10 picture may be $20 on a normal day, but a sale day will knock that down to $10, easy. Aaron Brothers and Michael's (both stores have great selections) have amazing sales in which frames are reduced up to 75% off. Always keep your eyes peeled for coupons in your local paper or Valu-Pak. Also, in addition to the art and frames section of these stores, you may want to check out the wood projects and kids' sections. I've found thick, unfinished backless frames for $1.50 each. The frames were meant for kids to decorate with glitter and sequins, but they looked amazing framing some 4x4 color prints I had purchased on Etsy. If you are a good bargainer, it never hurts to befriend your local frame consultant to see if you can't buy some of the cast-offs or rejects — the frames that other people order, and then decide they don't want for whatever reason. By far the most consistently affordable place to buy ready-made picture frames is IKEA. If you happen to have a Swedish mega-maze somewhere near you, check out the frame selection on your next day-long venture. A smooth black picture frame is just about the easiest thing in the world to scratch or scuff, so frames with dings and divots are frequently tossed in the bargain bin as soon as they are unpacked. Lots of stores have their bargain section in a back corner, so always check there to see if there is something you can use. Most minor imperfections can either be easily fixed with some nail filler and black marker, or improved upon by "distressing" the entire frame with sandpaper so that it has that shabby chic look that is so desirable these days. Department stores have more than their fair share of hideous pre-framed art. If you find a piece of pre-framed hideous art with a good frame, there's no need to keep the art. Just toss it out and insert your own awesome blacklight unicorn poster. Ross is particularly good for this. Used frames featuring all kinds of horrible art can be found at thrift stores, garage sales, flea markets, and next to dumpsters all over the country. You can keep the existing art or throw it away. Making an ugly frame look amazing doesn't take much effort — just some acrylic paint or a rattle can in an amazing color, a well-ventilated area, and a good drop-cloth, and you've got yourself a snazzy, incredibly hip frame for your art. I've actually seen some pretty cool-looking rooms that are decorated entirely using empty picture frames that have all been painted the same awesome color, or simply matched according to a general sense of aesthetics. Of course, if you have an entire tool shed just bursting with state-of-the-art miter saws and bevellers, you can always make your own frames. There are plenty of glass or Plexiglas "frames" that consists of a clear cover, a solid back, and small clips that allow you to protect and hang your art without a traditional "frame". I buy these in bulk at my local art supply store. Gallery-style frames are another option — a very thin plastic frame that barely shows allows you to place art inside and press a piece of glass or plastic into little grooves in the front of the frame. 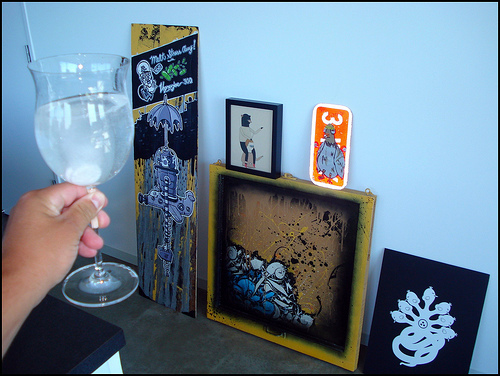 Gallery frames are cheap, but do significantly limit the thickness of the piece you are displaying. Hanging framed art is an art in and of itself...or is it a science? In any case, there are many different ways to get the look that you want. If you want to hang frames in a gallery style, take some advice from the pros, like an actual curator. Or, you may find it easier and more cathartic to cluster your framed art in a more unique and devil-may-care manner that doesn't depend on straight lines and perfect corners. There are many different ways to hang framed art. Some people like to use eye-hooks/staples and wire across the back of the frame. The wire can be kept short, and tucked behind the picture so that the nail is hidden when the picture is hung, or long, so that the picture hangs down from a nail. I've seen really pretty hangings done using silk ribbon that is attached to the top back of the frame using strong staples. Of course, you can save a bundle on framing costs by simply skipping the frames altogether, There is plenty of art out there that doesn't have to be matted and framed; in fact, almost anything that is displayed with a certain amount of flair becomes art, like a wall covered in a rainbow of paint chips from Home Depot. For more traditional 2D art, like posters, paintings, and collages, you can either leave the art as-is, or have it mounted on a poster board to give a little more heft and to keep it from getting damaged. Posterboard is fairly inexpensive, and you can do the mounting yourself or have it done at a frame shop for a steal. This method is my favorite because it's easy, breezy, and slightly edgy. Take a long piece of wire (thinner gauges are better), some small nails, and a hammer. Pound the nails into your walls at whatever locations you feel are appropriate, and string the wire taught between them. It helps to angle the nails AWAY from the direction that the wire will be pulling. You can create a single horizontal line, many horizontal lines, zigzag lines, vertical lines, or spider webs — it really doesn't matter. You can hang the wire up high and string it across a room, or stick to one wall or small area. Whatever floats your boat. Next, take a handful of clothespins (the newer kind works better than the old fashioned style) or binder clips, and attach your art wherever you like it. I like to hang concert posters high up on horizontal wires, and clip vintage postcards along vertical wires. A series of black and white photographs evokes a darkroom or photographer's studio. You can hang letters from your grandma, childhood mementos, potholders, jewelry or even air plants, if you want. Mixing up colors, sizes, and shapes is fun, or you can choose one particular style and stick with it. Variety is the spice of life, but not everyone likes as much spice as I do (for examples of both ways of thinking, check out this apartment featured on design*sponge). 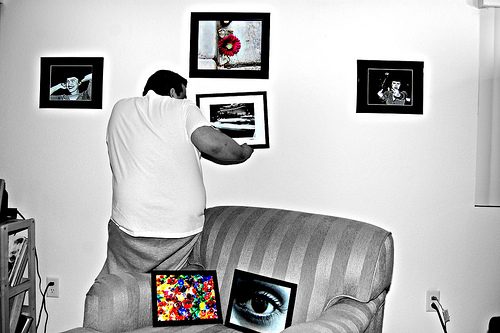 With a bit more effort, you can use clips sans wire to create a gallery-like arrangement of unframed art. This method doesn't afford you as much flexibility with rearranging your collection, but looks clean and unencumbered. A slightly less flexible way to show off your unframed pictures or posters is to hang wire clothing hangers from a nail in a prominent location, and then use clothes pins or binder clips to hang the art from the clothing hangers. Hangers are frequently used to make mobiles for 3D art display, so you can move the medium to the 2 dimensional for a new take on a common household item. If you have lots of smaller pieces of art that you want to display, try hanging a series of clipboards on your wall. Art can be neatly pinned to the center of the clipboard, and the back of the board provides a frame in which to show off the art. A clipboard can be had for as little as $2 (I've seen them for $0.88 on some websites, but you have to consider shipping). Buy a couple dozen of them, and hang them in neat military lines or in a more random fashion. If the dark brown background of the clipboard doesn't suit you, you can always paint the clipboard white, yellow, or any hue that makes you smile and offsets your art collection. If you enjoy rearranging your collection, but have a morbid fear of nails and the damage they cause, you can turn a huge space into a magnetic board of your own with magnetic paint. Assuming you have the ability/right to paint your walls, you can create art spaces with a roller and a can of Rustoleum brand magnetic paint (runs about $30). Add some snazzy, modern-looking magnets for about $20. 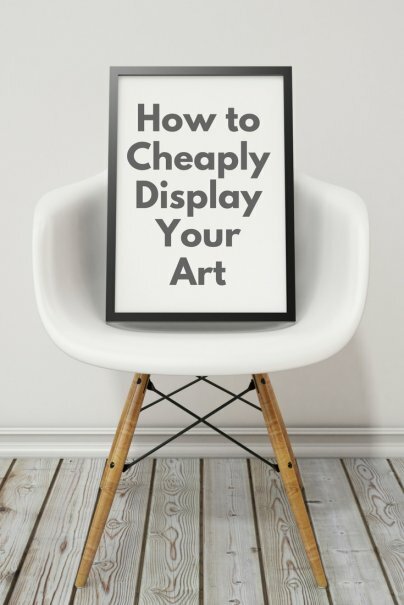 While $50 isn't a drop in the bucket, it's cheaper than framing your entire poster collection. A whole wall (or room) becomes your personal art gallery on which you can arrange your drawings, newspaper clippings, posters, collages, or anything else you can think of. The best part is you don't have to refill and touch up holes in the wall every time you want to rearrange your artwork. Whoever said that art had to be hung? One of my favorite ways to display my favorite large oil paintings is to set them on top of dressers or low bookshelves, or even rest them on the floor, leaning against the wall. The look is casual, you don't have to mar the walls with nail holes, and you can move stuff around without having to worry about busting out the measuring tape or level. Personally, I'm a clip frame and black painted wood frame fan from way back. You're so right too, the framing can eat up more of your art budget than the actual art. Another hack I've used for empty frames without glass is to get the glass cut and put in at an auto repair shop. They don't necessarily have low glare glass, but they can put it in with epoxy and it doesn't even show. I've also had them cut and glue in mirror in the same way, turning fun frames picked up at markets around the world into funky bathroom and guest bedroom mirrors for cheap. It just takes adding on some of the DIY hardware you suggested onto the back afterward. Congratulations on a cool article. This is a great article, I'm going to pass this on! Thanks, Myscha, those are great ideas! Since I'm such a klutz, I tend to stay away from glass altogether these days, but it does lend such a professional finish to framed art. I never thought of checking with glass repair places for cutting art glass - that's brilliant. As a working artist I always appreciate when none art blogs do anything that move the idea of art appreciation further. Great post. IKEA has small great basic frames that are cheap and look great. I have a lot of nice pictures from my travels and love taking them and putting them up. they mean a lot to me and are of my travels experiences so i don't want them in a bad frame. Michaels always has great deals on custom frames, 50-60% off and that is where I get mine done and for the best price around. the pictures come out great, and for me its an investment cause I will keep these pictures with me forever. Michael's Crafts Store has a weekly ad in the paper here with a 50% off coupon, good on just about anything in the store that's not already on sale. Their frame selection is pretty good, and they'll cut custom matting for pretty cheap as well if you go that route. One comment on "The Art of Leaning". It's fine for small pieces, but make sure you anchor larger ones. Right after we moved, I put a large framed mirror on our mantel. Since we were still unpacking, I didn't hang it, but leaned it against the wall. This worked fine for a while, and I forgot about it. Until the day 2 friends came over to study with their young children. The little girl (about 6) was playing with a rubber dog toy and bounced it hard against the wall. It created enough of a vibration to send the mirror crashing down, shattering all over the coffee table and floor. I wasn't upset about the mirror, but I was fretting because if one of the tiny kids was standing in the wrong place, they could have been injured by the heavy mirror or flying shards of glass. I don't know if a mirror qualifies as art, but a heavy art piece would have been nearly as dangerous. Safety first! I was going to mention Michael's, but wasn't sure if it was a national chain or only on the West Coast. However, even with the coupons, custom framing is pricey (ready made frames are cheaper, yes). For instance, my sister recently returned from Spain with a painting that she took to Michael's to get framed. It was an unusual size, so wouldn't fit many of the ready-made frames. Using a 60% off coupon, a simple black frame, and white matting, it still cost her over $100 to frame it. Aaron Brothers. Great selection, good value, and they have weekly sales on certain frames. They'll do the matteing for you if you like. Check thrift stores for frames, I have had great luck in some finding fun and funky frames of all sizes very a very low cost, and if its all dinged up... spray paint is your friend! "There are plenty of glass or Plexiglas "frames" that consists of a clear cover, a solid back, and small clips that allow you to protect and hang your art"
I found these in a variety of sizes at our local dollar store. For all those who are thrilled with deep discount coupons, please shop around. They start with an inflated price and it's usually no deal. I agree with George Johns. 50% off of a $200 framing job for a single piece of art isn't really much a deal. If you can manage to stack or combine coupons, you might get somewhere, but even then, it's unlikely that you'll get away from custom framing without paying through the nose. Great suggestions here! Thank you so much. I'm planning a gallery showing of my photography and if all goes well, I'll post some of my work with your idea of frames! Nice article. Very useful and informative. my sister is a painter. However, she's 16 but this is really a great article to help her. I just framed a bunch of photos for under $10 by picking up some frames at a thrift shop down the road. Another thing I've seen from an interior designer is getting skirt/pants hanger and clipping the art on the hanger, then hanging it from a push pin in the wall. Cheap and functional. I collect thin black wooden frames from the thrift store or yard sales. They usually cost about $1 a piece with glass, and accomodate my ever changing display of prints, card art, magazine clippings. The frame color ties all the pieces together. I don't mat them with matboard but use heavy construction paper rubbed with various craypas colors to bring out the print colors and tie the pics together. This allows me to use odd sized frames with odd sized pictures. Choosing the right frame is very important to enhance the look of your picture or artwork. Your detailed description on why and when to choose a frame type helped me as I love taking pictures and have a lot of them yet to be framed.